Today we have the lovely Stella Chuu. 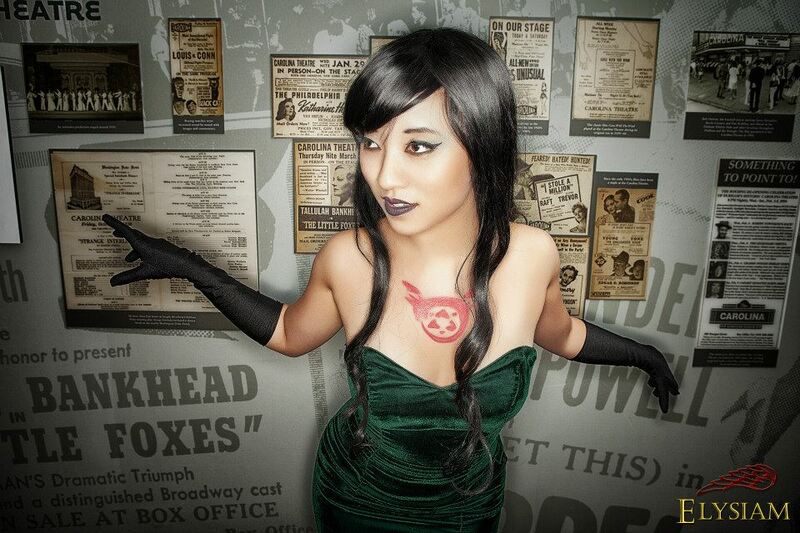 Her enticing burlesque performances, and her mastery of sewing and prop making put her on my list of a top cosplayer. For all photographer and costume information, check out her Facebook Page. Andy: What was the first Con you went to? What was your general reaction to it? Who did you take to that con? Stella Chuu: My first con was Big Apple Anime Fest. I was about 12 or 13 years old at the time and very naive. Instead of paying for a badge, my friend got us staff t-shirts through her sister who was working at the con. So the five of us we had to pretend to be volunteers that were constantly on break. It was very stressful because we always had to run around and avoid actual staff members. On a brighter note, I discovered a lot about the anime community. I bought my first print, met some amazing artists, and found a psychedelic anime called Catsoup that has left a deep mark on my tastes in film. A: What was your first inspiration to get you into cosplay? What was the first convention that you cosplayed at? What was your confidence in yourself and your body image when you first started cosplaying? SC: I ran the anime club at my high school and made my members dress up as characters from Naruto on Halloween. That was my first cosplay. Later, I cosplayed as Misa Misa at my first Otakon. In the last two years, I’ve been doing a dozen cosplays a year. The combination of cosplaying and burlesque performing has really boosted my confidence in my body. I’ve never had body issues but performing has made me more fit and made me aware of the kind of food and products I consume, making me more health conscious. A: Being that you were in a anime club in high school, what is one Anime that you feel doesn’t get watched a lot but should? What is your favorite 90’s Anime show? SC: I can list many animes that have gone under the radar over the years. Among my favorite are Now and Then Here and There, Idiot Adventures Photon, and Catsoup. As for my favorite 90’s show, I’d have to say Cowboy Bebop. I can watch that show on repeat anytime. A: What anime are you watching right now? SC: Currently I’m watching Tamako Market, Amnesia, Magi, Space Brothers, and Shinsekai Yori. Each one is still airing episodes. A: One of your Cosplays is Ivy from Soulcaliber, what did you see in her character that made you want to chose her to cosplay? Talk about what went into making her character. How awesome did you feel carrying a whip around all day? SC: I love that Ivy is a sexual icon as well as a badass. I enjoy cosplaying women who are powerful and have strong personalities. On top of that, her costume design is gorgeous and a big challenge. I commissioned a friend of mine who is an extremely talented seamstress to make me the outfit while I made the armor pieces and whip sword. The whip was fun to play with a bit cumbersome at times while transporting it around a convention. A: Another thing I noticed, that I think is unique is your Burlesque performances. How do you think the two, cosplaying and burlesque, are different from each other? Or do you think they are more similar? SC: Cosplay is the embodiment of an often fictional character in both costume and personality. Burlesque is a story-telling performance that can be sensual and hilarious. The mediums are different in the way they are presented. I cannot tell a story with my cosplay as the backstory usually already exists. Whereas with burlesque, I am making a theatrical performance. Certainly the two can merge together. I I specialize in geeky burlesque. A:What is one memorable burlesque performance you gave? Why? How do you psych yourself up to get up there and perform? SC: Performing at Gen Con Indy was pretty spectacular. The entire show was put together with the help of our fans and some last minute thrown together staging. It was the largest audience I’ve ever performed in front of; roughly 400 people. The audience was very receptive and I had a blast being a nerd on stage. I used to get really nervous before performing but now it is just like riding a bike. I perform 2-3 times a week and it has become my part-time job. A: How does Facebook influence your costume making and character selection? SC: It is always an artist’s struggle to be original. Seeing better costumes on my facebook feed helps me strive to be better at my craft. I try to not cosplay characters that are too common. A: What one piece of advice would you give to someone wanting to make their first Superhero cosplay? SC: Commission someone to make it for you. I think more people should support local artists and craftsmen. I commission about half my costumes. Despite the fact that I could make a costume myself, I’d rather help a fellow artist and work together to make something great. A: What conventions do you plan on attending and in what capacity as a cosplayer/burlesque performer? SC: I’ll be running a panel at PAX East on sunday at 11am called ‘You Game Like A Girl: Tales of Trolls & White Knights’. I’ll be cosplaying and possibly running a panel at Anime Boston. I’ll definitely be performing at Gen Con Indy again. And there is a possibility that I’ll be performing at DragonCon. Since I live in NYC, New York Comic Con will forever be on my list. And lastly, I cannot wait for Anime Expo. It will be my first con on the west coast.